It's not so often I get to attend speaker events locally but one by the name of Aaron Draplin, hailing from Portland, Oregon, got my attention when he was expected to be in Vermont. One event was hosted by the AIGA VT which cost a bit more and challenging to get tickets since this was a workshop. The next evening was at the University of Vermont at the Ira Billings Lecture Hall, hosted by the UVM Ski & Snowboard club and sponsored by Healthy Living and Market Cafe. Fortunately, the ticket was ten dollars compared to the previous night through Eventbrite. This event was for his book tour titled " Pretty Much Everything " in hardcover which I got at the bookstore wth beautiful looking logos on the outside and inside of the book. It surveys his mid-career work and examines the processes he's gone through. Although, the weather had snowy and wet conditions that made it a bit slushier on ground as I had to find parking, thanks to the Parkmobile app after grabbing Starbucks Coffee en route. I almost felt like a student again walking on campus to the other side at the Lecture Hall only to see some people already inside the building. I could see some staff walking about in the hall and getting the tables ready. Aaron then showed up down the hall, appearing out from the lecture hall doorway having a chat with other people. A few minutes later, he starts approaching the first few of us at the doors about to sign autographs. 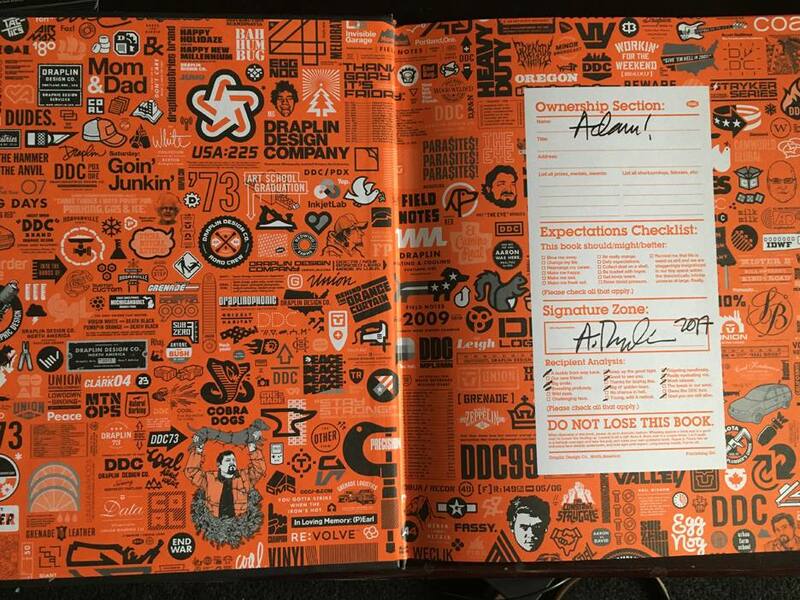 I've been made aware of his work the last few years based on some of the graphic design work he's done for Burton Snowboards, located in Burlington, Field Notes ( one of which I'm familiar with ) and a few other images, especially the Obama administration. AutographAfter that, I picked up some food from the tables and found a seat in the hall, seeing a DJ warming up the audience near the podium section. It would take another half hour for the entire auditorium to fill up and lights go out for Aaron to be introduced. His talk took about two hours going from 7pm til 9pm with inspiring insights and experiences. One part of his talk amused me by his mention of my hometown Cleveland which he already toured in. After it all ended, I decided to drive back home which would be a 45 minute drive back south despite the fact it was a Friday night. The weather was getting crappier and I did'nt want to risk the road getting worse by the hour. People may wonder why an illustrator like me would go to this and frankly, to me, he's an inspiration when it comes to design as it's one part of what I do. But also, the process of design fascinates me, giving way for an illustrator to understand what graphic designers go through. He's done some illustration work, so that part applies. Many of the images he's done were produced on Adobe Illustrator which is obvious and they have this clean and concise look. Illustrator has such wonderful precision that I can appreciate and I'm aware that there is a competitor to this from Affinity Designer which is very tempting. And it was all worth it as I plan to read the book throughout the week.